Emily was diagnosed with a yolk sac tumor when she was about a year-and-a-half old. The tumor was the size of a grapefruit inside her tiny little abdomen. Even though our Emily was diagnosed with this frightening form of cancer, her team of doctors and nurses assured me that Emily’s cancer was not only treatable but highly curable! Emily endured months of surgeries, grueling testing and rigorous chemotherapy sessions (which would last for five straight days). 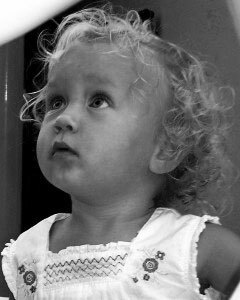 If Emily’s blond ringlets had not fallen out due to the chemotherapy, no one would have been able to tell that she was even sick. She maintained her sweet disposition and contagious little giggle through out all of her treatments. Emily loved to play dress up with her big sister, Katherine, with all of their princess outfits! Nate, her big brother, would read to her for hours and hours, the same books over and over. 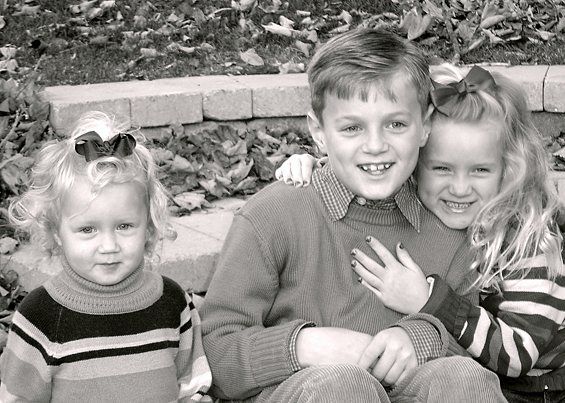 How Katherine and Nate adored their little sister, Emily! Emily’s treatment had been so successful that her last MRI clearly showed that the tumor miraculously disappeared. In fact, three radiologists had to review her MRI films due to the fact that there wasn’t even any residual scar tissue left. Emily’s doctors said it was as if she never had cancer! 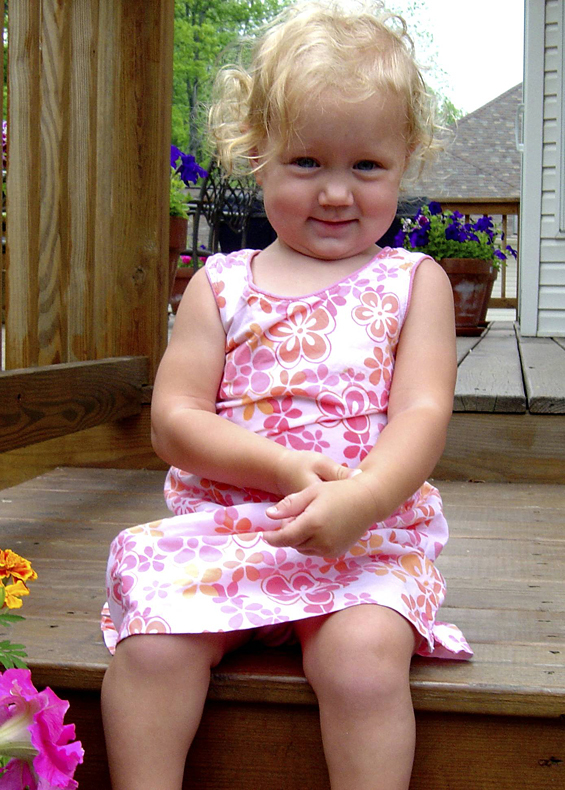 Regardless she was scheduled to begin her last chemotherapy session on her second birthday, February 24, 2006. This last treatment was just to be sure that there were no traces of cancer left inside of her little body. We celebrated Emily’s second birthday in the hospital. Some of her doctors and nurses had planned a surprise party for her and showered her with gifts, balloons and the whole works! She had a constant flow of visitors to help with the celebration. After Emily’s grandparents left, Nate and Katherine came with me bearing cupcakes for everyone on the floor. I could not think of a better birthday present than being told that this was Emily’s last chemotherapy and she would be coming home cancer free!! Emily would finally be able to live as a normal two year old! Tragically, that never happened. Sunday, February 26th was Emily’s third day of her last chemotherapy treatment. It started out as any typical morning in the hospital. Emily ate her breakfast while watching her favorite Barney episode as doctors and nurses made their morning rounds. Emily and her mom took a few laps around the floor with her IV equipment while she pedaled her big wheel with all of her might. After playing in the activity room and scrubbing the play kitchen set with the nurses’ stash of alcohol swabs, it was time for lunch and an afternoon nap. Emily’s grandparents stopped by for a brief visit. That was the last time they ever saw their little “Emmy” alive. Emily’s fatal dose was administered at 4:30 Sunday afternoon. She woke up from her nap very groggy which was so out of character for her. She kept trying to sit up and asked her mom to hold her in her lap. As she picked her up to cuddle with her, she noticed how her little body was so listless. She kept grabbing her head and moaning that it hurt. 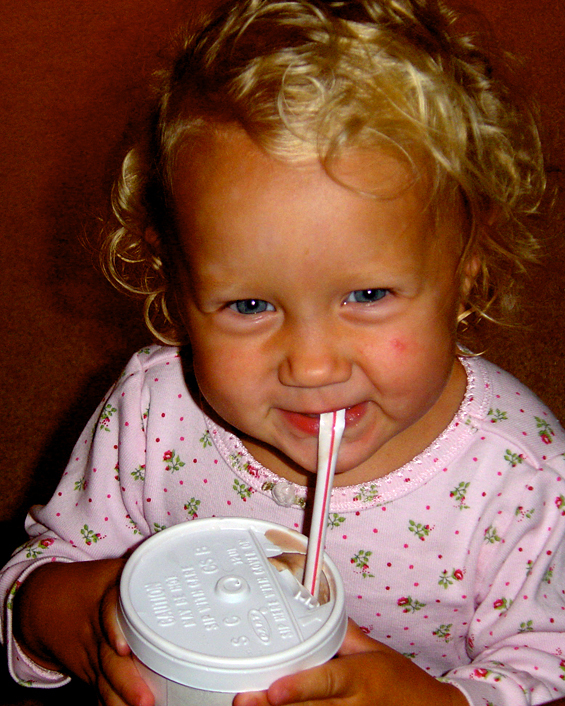 Emily spotted her mother’s can of Coke that she had on the tray and begged to have a sip. She sipped the rest of the can through the straw in a matter of seconds. She cried for more before she started screaming, ‘Mommy, my head, my head hurts! MY HEAD HURTS! The whole time she was screaming she was holding the sides of her little head. Her mother frantically called for the nurses as Emily began profusely vomiting. I was just walking in as the nurses were grabbing her from her mom’s arms. Emily went completely limp and the nurses began to resuscitate her. Within seconds, there were doctors and nurses everywhere. Emmy was rushed to the intensive care unit as the team was urgently attempting to find out what could possibly be going so very wrong. Within the hour, my precious daughter, Emily, was on life support. We held Emily’s little hand and ran along beside her bed as she was rushed to have CT scans and other tests to determine the extent of damage to her brain. Since the life support machines could not go through the scans with her, the nurses climbed on the bed and manually kept her breathing during the testing. This was so surreal to have this happening and still no answers as to why Emily was dying. This couldn’t really be happening! We should have been having dinner and talking with Nate and Katherine on the phone to make sure that they had their book bags packed and ready for school. What was I going to tell Nate and Katherine? The last time they saw their little sister alive was on her birthday, February 24th. They were not allowed to visit on the weekend due to the cold and flu policy. What a joke. No one got any sleep that night. We sat on Emmy’s bed holding her hands and kissing her little toes as the machines kept her body alive, hoping that we would wake up and this terrible nightmare would be over. It never ended. It just got worse. The next morning the room was filled with strangers’ horror-filled faces as we were told of how my little angel, Emily wound up brain dead and on life support. Her mom and I were told that even though she was still being kept alive by life support, Emily was essentially dead due to the massive brain damage she had incurred. Our Emily was killed by an overdose of sodium chloride in her chemotherapy IV bag. Wednesday, March 1st was supposed to be a day of celebration. Before entering the hospital, we had planned a belated birthday and a cancer-free party for our Emily. Instead, our little Emily was delivered to the Cuyahoga County Morgue. 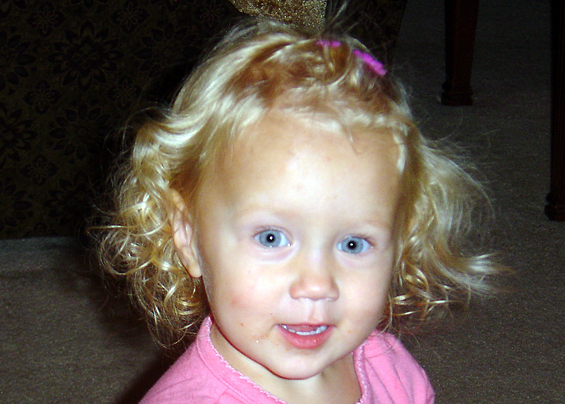 My family has been completely destroyed by the preventable and tragic death of sweet little Emily. A pharmacy technician that had been working for the hospital for quite a number of years decided not to use a standard prepared bag of sodium chloride solution ( with less than 1% of sodium chloride solution). Instead, the pharmacy technician filled a plastic bag with a concentrated sodium chloride solution of 23.4% of which she had compounded herself. When the pharmacy board investigators and other officials investigating Emily’s death asked the technician why she had made this outrageous error, she replied that she did not know. She claimed that she knew that something was not right but she was not sure. The pharmacy technician was asked if she knew that an overdose of sodium chloride could result in death. She claimed that she was not aware of that fact. How can a person who works in a pharmacy and compounds medications daily not know that? At the time of Emily’s death, Ohio didn’t even register pharmacy technicians. In fact, there weren’t even any training or licensing requirements. You guys did a really great job!!! I’m impressed! Emily’s story has really touched me a great deal and i hope this foundation goes very far and high in success years and years down the road. Your doing a really great thing. You have my support and my prayers are with you and the foundation. God willing this will be a great success. That is a very touching story and I am very sorry for your loss. I am very happy that you are one of the few people that has been able to turn their situation around to help prevent others from experiencing the same kind fo loss you have. It was so nice to meet you tonight. This is an incredible website. My prayers are with you and the Emily Jerry Foundation. I wish you only success. Chris it was really nice conversating with you tonight. I have viewed your website and it has touched my heart. I was with my husband Gregg at Flemings. I came home and gave my children a hug. My children our my world but you help me appreciate them even more. You are truly doing a wonderful thing, and I wish and pray for you and your future endeavors. I’m sitting in Starbucks (eavesdropping by accident) and I heard about your foundation…so I thought I would do a google search…and found your foundations website. I am so sorry to read about Emily’s terrible tragedy. 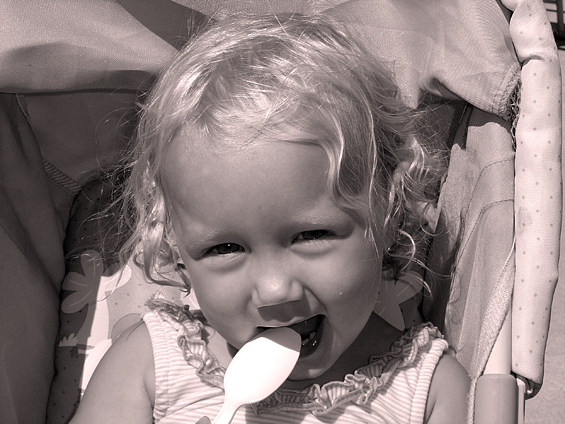 I am having trouble writing this email because I am at a loss for words…what a beautifulbeautiful little angel. I will now review the rest of your website to see how you are trying to stop this from ever happening again. Good Luck Christopher…my thoughts will be with you and your family. It was a pleasure meeting you last night, sorry we kept bumping you 🙂 Your daughters story really moved me – my youngest child is named Emily too. My thoughts and prayers are with your family. Thank you for starting this foundation so others do not have to go through this nightmare you are living. i am numb at the realization of what you and your family went through. words fail me right now. thank you again for finding strenght to create you foundation. I saw Emily’s beautiful face on CNN.com last night which prompted me to read…. Needless to say, I was heartbroken for Emily and your family. I saw her face all night … all day today at work and still I am home this evening looking at your site. I am overwhelmed by the incredible strength that you and your family have found… To move forward and fight … The need to find a way to keep something like this from happening to other families …..
You are an inspiration to me and should be to all parents around the world. You are making a difference when some of us would not have the courage to speak up. I would like to thank you for that. God bless you and your family. While horrific what this family is dealing with, decades of progress in patient safety were erased by the manslaughter conviction of the pharmacist involved. Eric was not even mentioned in this narrative, yet he was given the blame for the error. Systems need to be built to protect people, not blame the easiest target. Shame on Ohio. Dispite the injustice to the pharmacy profession with the prison sentence to Eric, this foundation is helping move healthcare forward by highlighting the need for pharmacy tech education and regulation. We are human. Humans make errors. As long as a human is involved, errors will happen. We can decrease their occurence. Systems to prevent errors are the only way to decrease these terrible situations. Was this hospital using safe storage methods for concentrated electrolyes? That is standard in the industry and would have give a layer of protection to human error. That NaCl should have been stored in a manner to make it difficult to select incorrectly. Eric was not given a good system in which to work. Chris, this story of your child was very touching and as I continued reading it just had me in tears. My prayers are with you and your family. Thank you for letting my know about your foundation, and I will also let others know. While I was reading this story, I cried about 4 times. I am a Pharmacy Technician and this story compells me to become even more dedicated to my job and decreasing medical errors in my work place. I will check again and again and again at least 10 times, every single time I prepare a medication for a patient so I can avoid the same situation as Emily’s. So rest assured, that you moved yet another person, and this is one more person that will work 10x times harder to prevent medical errors in this area. Thank You. Thank you for the treat at Starbucks today. I apologize for not showing greater interest in your story, but I did not want to upset my inquisitive and sensitive daughter. Your family’s story is upsetting and tragic. I can’t imagine what you’ve been through. I’m glad you’ve found a positive way to channel your grief and anger. I wish you the best in your efforts. I actually haven’t read the book, but “The Checklist Manifesto” sounds like it has some great ideas about reducing medical errors in cost-effective ways. Hi I am the lady with the yellow truck in the line at the bank. I really don’t know what to say. I don’t know how much help I can be right now I am on medical leave for four more weeks from work. I am a homehealthaide for deapartment of senoir and adult services. I have six children and have not much education, but I want to learn how to advocate for children. I hate hearing about young children lossing their lives and it nothing but an animal is abused or killed people protest for days and even weeks. Children are a precious gift from god. Now I love animals but our kids needs attention. So let me know what I can do. I am a Tampa Pharmacist. I have launched a hunger strike against pharmacy giant MEDCO to bring awareness about its prescription filling policies. I hope things improve in the medical world to keep any family experiencing what yours has gone through. We are always here to support you. Thank you for being such a kind person, and caring customer. My heart is with you and little Emmy. This morning, myself and 71 other 1st year nursing students began studying medication administration at a community college nursing program in Washington state. The first thing our teacher showed us was Emily’s story via YouTube. I do not think there was a dry eye in the room. I hope you can take solace knowing that we will never forget her, and that it helped us all understand how critical proper medical administration is. Thank you for sharing her story with all of us. Your story is profoundly tragic and moving. As the father of three young children, 6 and 4 year old twins, all of whom spent weeks in the hospital when they were born, it is easy to relate to the terror and loss such an experience would bring. Our oldest was born with a serious heart condition requiring open heart surgery when she was 5 days old. We are greatful for the skilled surgeon and medical care that helped her survive and thrive but were concerned the entire stay that something could go wrong. My company has the privledge of working to make IV mistakes and tragic accidents like Emily’s a thing of the past. Though too late to spare your daughter and your family from this senseless tragedy, we hope to spare thousand of others from injury or death every year. We hope your foundation will help educate and raise awareness of this issue while we work to provide the tools to make it a thing of the past. My heart will be forever touched by Emily’s story. THANK YOU for not only sharing and bringing awareness to this medical error, but also implementing steps to prevent this from ever happening again. I sincerely applaud your efforts towards the Emily Jerry Foundation. We used to work together and I know how much you adore your family. I had heard about Emily’s death, but never knew exactly what happened until now, and I can’t imagine the grief and heartache that you, Kelly, Nate and Katherine have endured. Your effort and dedication will save others. This breaks my heart. I was very surprised that there are no requirements or training required for someone to compound medications and vaccines in the state of Ohio. I am so very sorry for your families grief, that’s all on can say about such a tragedy. I hope that this foundation can change legislation and mandate the laws of pharmacy technicians. God Bless you and yours. I can’t find any other words to express my feelings about your situation…..God Bless You! WOW! I never heard this story! My prayers are with you and your family and it is comforting to know that you have used your tragedy to bless others. I would like to express my deepest sympathy due to the loss of your angel. I can’t imagine how I would be able to deal with that tragedy. Children are precious and their lives can’t be protected enough. I saw the flier for the Fund Raising Event given @ Phil The Fire Restaurant and will try my best to attend. I missed seeing the date of the event, but will research again. I will keep you and your family in my prayers as I know the feeling of losing loved ones. May God continue to Bless you and grant you Peace. Chris, just wanted to say what a great website this is, and lunch with you was enlightening to say the least! Good luck to you as you proceed with your goals and dreams! Peace! So very sorry for your family’s heart breaking loss as a result of a medical error. Thank you for raising awareness and promoting medication safety. Keep up the great effort. I still remember reading the Josie King story years ago when I first started a role in medication safety at my hospital. Sharing these preventable tragedies is so compelling and helps so much in advancing patient safety in healthcare. God Bless you and all your friends who have experienced this tremedous tragedy and loss. While I can’t even begin to assume that I could imagine anything like the pain and suffering you all have felt, please know that I wish you all peace in your lives. I admire your bravery in wanting to make some changes as a result of this tragedy. Just know that you all have had a profound impact on my family and we will do all we can to support your efforts. Always in our prayers and wishes – God Bless you. I actually heard about your story in one of my pharmacy Techinican classes. I had to do some more research on this. It was a very very sad story and I am sorry for y’alls loss. 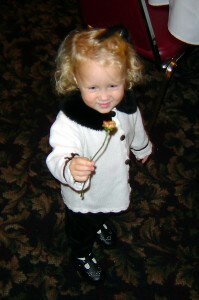 She was a beautiful little girl. This is why I wanted to go through this training before entering into the pharmacy. Currently I am a front desk agent near Orlando FL and I found a great school to help teach me what I need to know. I have read through this story about 10 times now and it still moves me. I never quite make it through. I find it equally moving that you could arise from this tragedy and honor Emily the way you do with the Emily Jerry Foundation. Keep up the good work. I came across Emily’s story while doing a continuing education test that is required by the National Pharmacy Technician Certification Board. I am a Pharmacy Technician in Mississippi, and much like your state was, mine didn’t require techs to be certified. Luckily with a lot of pushing, we finally got them to require techs in Mississippi to be certified in April of 2011. I personally feel like all technicians or anyone working with medications need to be certified or at least attend classes. I am like you; I have no idea how this tech couldn’t have known the difference in those two drugs. So many things went wrong that day. When I read little Emily’s story it just broke my heart. To know that this technician knew something wasn’t quite right, yet she continued to mix this solution anyways. The first rule we learn in Technician school is to always ALWAYS ask if we have questions or are unsure of something. Your dear little girl’s story really touched me, and I hope that only good things come from the death of your daughter. Everyone should be aware of just how dangerous some of these drugs can be. I’m so glad you shared her story with the world. I wish you and your family all of the best!! I just cried a little as I read poor little Emily’s story. Its so heartbreaking for a little girl to go through something like that. My heart goes out to her, and to you the parents. I support your cause 100% and hope it goes far. Emily’s story was shared during a work related meeting today as we discussed latent errors. Myself, as well as others in the meeting were deeply moved by Emily’s story. My thoughts and prayers are with you and your family. As I progress in my role as a healthcare professional I will keep the beautiful image of Emily in my thoughts and actively work to prevent such tragedies. OMG I just hear about this on tv today, so sorry this tragedy happened to your innocennt, beautiful baby. Even though it’s a few years after the fact it’s so great that they are still boardcasting this important story. Continued success to this foundation and God bless you and your family members. I just wanted to say this is a very tragic story and we all in this world should take extra percautions. We here(SJVC PHarm Tech students) at SJVC Bakersfield, Ca , will never forget this little girl. She is an ANGEL. We students here at SJVC will always take this story in consideration when it comes to working in a pharmacy. Keep up the good work with the Emily Law Foundation. Your family will never be forgotten. What an incredible story you share. I can’t imagine the pain and suffering you have all felt, yet it seems you are able to be at peace with “God’s perfect plan.” I am a Medical Assisting instructor at a career college in Nampa, Idaho. After hearing a presentation from the Pharmacy Tech program at our school, I will be sharing Emily’s story with all of my students in the pharmacology module. God bless you for raising the awareness Emily deserves. I am so sorry for your loss. We lost our daughter Amanda, on July 17,2010. She was 18, and had a very bad strain of strep throat. We took her to the doctor for the 3rd time and he finally admitted her due to dehydration. By the time we arrived at the hospital she began to run a temp of 102.4 . Long story short she died 2 days later after being put on a pain pump. I can not tell you anymore due to legal matters, but you can research GOOGLE and look for the petition that was filed with the Indiana Compensation Board and that will give you everything you need to know. Just type in her name . Loosing our daughter is the worst as you know. She was so loved that her viewing was the biggest the 45 year old funeral home had ever seen and our church during the funeral was full to capacity with standing room only left. We estimated that between the funeral and viewing we had around 3000 people. Please go to our website and help us prevent this from happening again. I will spread the word and story about your beautiful little angel with the beautiful blue eyes with everyone who will listen. The only thing that gets me through my day is knowing I will see my daughter again in Heaven. Just hearing your story today at SBC: brought new insight to our students and to us instructors/facilitators of “human error” and the harm it can due to another human being, when not watching what is being done. God Bless you and your family and I will spread the word of this wonderful Foundation. I applaud your Foundation and its commendable work to strive for better outcomes in our healthcare field. Thank you! I appreciate you coming to Sanford Brown Tinley Park and speaking about your story, it has really touched me and made me want to be a great pharmacy technician when i become one. I really hope you come back and speak again for future students because your story was really touching and it really was an eye opener. Once again Thank You and I hope you continue to keep her story alive. Chris and Eric embody the whole story. They come together to miraculously and transparently disclose the whole story. You’ll feel the pain, struggles, journey, forgiveness and triumph that both men experienced and are still experiencing. I just ran across your story for the first time today while looking for some information on medication errors to share with my nursing students. I teach undergraduate nursing students in the clinical and classroom setting, and I have seen negative student attitudes related to having to learn drug dosage calculations in class. I think there is a misconception that “the pharmacy will figure all of this out for me.” I work hard to instill the importance of checking and double checking every medication and every calculation to ensure that the medications we are giving are safe dosages following the “five rights” of safe medication administration. Your story has definitely reminded me of the importance of connecting the with the “human element” of drug dosage calculations when teaching nursing students. I will share your family’s story with my students to show them just how important it is to know what you are giving and why you are giving it in the clinical setting. Keep up the good work of ensuring that our healthcare systems are as safe as they can be. Thank you for sharing your story. This is such a tragic event and should have been prevented. This error made by the technician, checked by a pharmacist and should have also been checked by the Nurse infusing the medication. Today we have more education, certification and licensing to prevent such a tragic event from happening. I am a pharmacy tech. and I am always extremely careful about filling requests to make sure that nothing like this happens. It does get very busy and overwhelming but we still need to make sure not to make a mistake. This sorry moved me. I am going to school to be a pharmacy tech. For my class we are doing a paper on your daughter Emily. I would like to express my deepest sympathy for you. I am so very thankful that my teacher has told us to research your story it has really opened up my eyes. She was a very beautiful little girl. Cried a river upon reading Emily’s story. All my prayers to you and your family and to the sweet little angel who now is in the arms of God. I do hope and pray that no more little Emilys suffer the same fate. Indeed, ignorance is never an excuse especially if a life is at stake. Learned a great lesson here. Thanks for sharing and coming up with this foundation. All the best! I just listened to the pharmcon/ freece.com webinar for my required Law hours. Thank you so much for allowing all of us into your life and into your fight. I commend you for what you are doing and for taking Eric into your fight. It is good to know that something good can come from such a tragedy. I know Emily is watching down on your family and can not wait to be reunited one day! I attended your presentation in Williamston, NC last week. I am in awe; and have been deeply touched by the great things you are doing. I would love to share this story at one of my staff meetings. I wanted to know if this presentation was online anywhere? May God continue to bless, strenghten and heal you. I was deeply moved by your story and thank you for sharing it at our Patient Safety Summit in CT last week. My mission is to help with instilling high reliability (HRO) values and help make our organization safer for all who are treated here by focuisng on patient safety related issues and a higher awareness of preoccupation with failure, increased accountability and best practices to minimize human error. As a nursing student one of our assignments is to write an essay about medication errors and their danger. As I sit here reading your story tears are pouring down my face! I cannot imagine the heartache your family has gone through. That picture of your sweet Emily will stay in my memory forever and I will do everything humanly possible to prevent any medications errors that could occur in my career as a nurse. This story has touched me deeply and I am going to print it out and give it to all my class mates. Hopefully this story will prevent any one of us from making such a tragic mistake. I am so sorry for your loss. I hope that you can find some sort of comfort in the good that you are doing in your sweet daughters name. Mr Jerry I applaud you on your testimony to the Senate about SB 818. I am a father of three and I feel for your loss of your precious daughter. I spent a great deal of my evening last night writing every Senator to KILL the bill SB 818. I am literaly in tears after reading Emily’s story. We must do everything in our power to protect patients. I will take every opportunity I have to be an advocate for patient safety. As a pharmacist I could not agree more with you about keeping on eye on patient safety. It will be a long battle to prevent bills like this that benefit corporate greed. I am truly moved by your story. There are a lot of my family members who have been having treatment for cancers but knowing they’re older and can try harder to fight unlike Emily who didn’t have a chance after that horrible calculation of sodium chloride is just heartbreaking. I myself just foud out i have a brain tumor and have been having to make sure it hasn’t grown any, but it’s stil very scary. I’m doing a project at school about how chemotherapy is very harmful and I would like to share Emily’s story if that’s okay? I am again truly sorry and my heart goes out to you and your family. I am a Pharmacy Technician student in Michigan. To hear that a person who worked in a chemotherapy ward for several years would mix a bag for a child with a dose of Sodium Chloride that would kill an adult, then claim they didn’t know is completely ludicrous. There is absolutely no way on God’s Green Earth that technician didn’t know what they were doing. Over 20% concentration is just insane. You make a mistake that costs a two-year-old child their life, own up to it. Don’t hide behind the words of an eighth grader caught texting in class. My heart broke when I read your story. I could hear her little voice in my head and I am just in tears to think that she went through that. I am so sorry for your loss. My thoughts and prayers are with your family. I have 3 boys and I don’t know how I would make it through something like that. It was so good to chat with you today at the airport. When you handed me your card I knew a sweet girl was no longer with us. My heart goes out to you and your family. I hope I can be of help to you as we share a common cause in different fields of science. God bless your family and Emily and God bless you in your work. This deeply saddens me and breaks my heart!!!! I hope that hospital got sued! I’m so sorry for the families loss!! 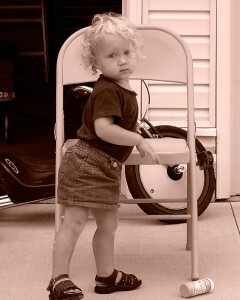 Such a darling little girl!!!! I am so so sorry for loosing such an angel due to humanly and technical negligence on those that we trust our lives in. It is just unfortunate. I heard about your sweet baby girls story at my patient services orientation for new employees at Children’s Mercy, in Kansas City, today. It was heartbreaking and eye opening at the same time. They used your story as a template for how even the smallest errors can bring so much harm and how this error should have never been missed if the system had been in place. Im so sorry your baby became a story for this but I truly believe her story alone will change the lives of many. I am a pharm-tech student currently, and am doing a paper on med errors, Emily’s story is shocking, and heart wrenching. I am appalled that anyone would/could get away with something so terrible. As a soon to be father I can not imagine the pain that you and your family must have gone through. I am encouraged by your strength in telling Emily’s story. I pray that because of this that all states increase the standard of education required for all medical fields. I cannot even begin to tell you how sorry I am to hear about your loss. I am a pharmacy technician, and I completely understand the role that we play in hospitals, is actually crucial. In Ontario, Canada where I live we have now implemented new laws that require all pharmacy technicians to be licensed and our field is regulated under the College of Pharmacist. We have more training and do everything we can to prevent medication errors. I was upset to read that the Pharm Tech had no idea what she did was wrong, it was very obvious and preventable. They should be trained better. I now train pharmacy assistants and tell them your story, so they will do every thing they can to prevent another Emily. I am so sorry about all that you have gone through. I want you to know that through your efforts, you have made a difference that is still effecting people. I am in my second week of nursing school at Forsyth Tech in North Carolina, and we learned of this story as a way to know the seriousness of using medications and what can happen if you make any errors. Though I wish it never had to reach that point, I am confident that this will serve as a reminder for all in the medical field, and will save lives by making everyone more cautious of their actions. Again I am so sorry for your loss, I can’t even imagine what you have had and are stilling having to go through. My prayers are with you and may God bless you abundantly. I am a first semester nursing student who is doing research for medication articles, and I just so happened to study upon your blog. I am weeping. My assignment has been to investigate medication errors, the different types of them that were made, and what could be done to prevent them. There are so many things in this situation that could have been caught by the medical personal on staff. Stories like this not only break my heart, but also encourage me to be a critical care thinking nurse who does not just do something simply because she is told to. I am going to write a paper to submit to my nursing instructor about what happened to your daughter. What a precious life that was taken from us so soon. I am so thankful you shared this with the rest of the world, and I hope that by the time I hit the floor as a RN, we will be well educated in the medications we are administering, and learn to trust our instincts. I am sure that pharmacy tech will live with a tremendous amount of guilt for the rest of her life. Its truly sad for both parties. My condolences. Mr. Jerry, I heard you speak today in Montebello, CA and the story of your beautiful daughter profoundly affected me. I applaud your willingness to speak out about this tragedy. Keep up the good work of the Foundation. I’m planning on meeting with our pharmacy staff first thing tomorrow to share Emily’s story. God bless you and Lisa! I am currently a Pharmacy Technician student, our book that we study out of is dedicated to Emily Jerry. I am truly sorry for your lost. Her story has deeply touch me. I pray for comfort, strength, and blessing for your family. I have been moved by the loss of your daughter for some time now. I am a former hospital pharmacy clinical manager and later served as director. One of the tasks that I had while serving in these roles was to orient new nurses on “Patient Safety”. I always told your story to grab the attention of these new nurses. I wanted to instill the value of critical y thinking as they performed nursing duties. I always included photos of Emily in the presentation to put a face on the importance of critical thinking. I have since relocated to another town to be closer to my daughter and grandchildren. I now have been tasked to speak to pharmacy students on medication errors. Again, your story will be brought to the forefront of these student’s minds. I hope in some small way, me telling your story helps prevent future fatal errors with healthcare professionals. I sincerely wish you and your family peace. I also wish you continued success in the fight against medication errors. Despite being an in-hospital error, we are using the youtube video and your story to train Paramedics and EMTs during their pharmacology training. Far too often are they taught that certain drugs are “safe”, which couldn’t be further from the truth. All of them have the potential to be extremely dangerous and life-threatening, period, whether they are administered incorrectly or not. Believe me, every student I have knows your daughter’s sweet face, and what happened to her is helping to train others in a different field. I am a first year med student and we were assigned to learn about Emily’s Law, due to medical/human error and the unbearable consequences. I am so deeply touched by this story because I have a two year old of my own and I couldn’t imagine the pain. My heart goes out to the family because this should have never happened, but Emily is a beautiful angel now and her story is not just that but it is saving lives probably every day. I can promise you as I make my transition into my career I will hold Emily’s sweet little life close to me knowing that I have to be absolutely accurate on everything I do. I was truly speechless, after reading this story about Emily. I’m studying to become a Pharmacy Technician and it’s a reality check to me. It demonstrates to me that I really gotta study and know what I’m studying and take every patients that I’m going to work seriously. These seems horrible to happen to a child but to have that Pharamacy Tech say she didn’t know this could happen, seems as if she doesn’t have the knowledge about compounding solutions. I’m truly sorry for your lose and God bless the family. my daughter was drugged beyond belief. besides suffering every minute of every hour of everyday, I am now beint threatened by The Doctors Company, to have all my possessions taken from me. We took one doctor to court and she won. The jury, some of them on opiates themselves, just were manipulated by a lawyer and firm called Taylor Blessey. My Tara is gone. My son now suffers, Tara’s father is a shell of a man, and my relationships with people and the world are not longer safe or the same. I am a pharmacy technician and first heard of Emily during my technician training program. In my position I work on a computer and never see patients, and it can be easy to forget or to overlook that there are real people on the receiving end of our computer work. Mistakes in this field, whether you’re a CPhT or a PharmD can end lives. This is why I keep a photo of Emily in my cubicle. That may seem extreme to some, but I feel that seeing her face everyday can keep me more focused and help prevent mistakes from being made. When a simple mistake, even one of just one character entered incorrectly into a computer system, could cause so much pain and suffering I feel it’s best to do anything possible to keep focus. Emily keeps me focused. Also, I work in Ohio but used to work in Indiana where we were required to have an FBI background check and obtain a license form the Professional Licensing Agency to practice as technicians. I’d love to help make that the law in Ohio. The fact that there is no licensing in this state is disturbing and negligent. I’d also like the law to require that all future pharmacy technicians must complete an ASHP-accredited pharmacy technician training program before being able to work as a pharmacy technician. I’d love to know how to get involved with making this happen. If you’d like to e-mail me that would be great. The company I work for maintains a 99.996% accuracy rate. That still means that 40 of every 1 million prescriptions we fill contains some kind of error. I think that’s too high. Maintaining focus, keeping perspective by keeping our patients in mind when we work, and mandatory education and licensing for pharmacy technicians could maybe see this accuracy rate increased to 99.9996%. 40 per million is too high. 4 per million is still too much, but with 4 per million the chances of a serious med error resulting in injury or death is reduced to almost 0. I am a pharmacist in Pennsylvania who has followed your tragic story since it was first reported years ago. My heart instantly broke for you and your family. I was aghast to learn the events leading to her death. The anguish your family endured is unspeaksble. The resultant lynch-mobbing of Eric Cropp by the Ohio State Board of Pharmacy and related judicial systems instantly ensured that 1) I will never work in oncology and 2) I will never work in Ohio where a medical error criminalizes the practitioner. Many other pharmacists feel the same after watching your horror story unfold. Thus potential pharmacist talent and intellect has been diverted away from a field of medicine that so deserves our full attention. This case has destroyed all incentive for pharmacists to learn and practice oncology: look what might happen to you? It could have been any one of us working in that IV room that day; but it was Eric Cropp. Your collaboration with Mr. Cropp to improve the systems is beyond stupendous. Love love love it. It is the stuff movies are made of. You are changing the system… Thank-you. I stumbled upon sweet Emily’s story today, by chance. I am a medical billing and coding student and currently working on my pharmacology and pathology course. Our assignment was to find a medication error story and document the findings, I found Emily. She made me smile and go back to the days when mine were young. The hospital broke my heart by allowing a tech to mix compounds intended for your beautiful angel. Her passing was irresponsible. I can only imagine what you and your poor family felt that day. She may have her wings, but it can never heal your hearts. Remember the laughter. Remember the joy. You are blessed with beautiful souls. I came across the story of you most unfortunate situation by way of an assignment that I have for my for one of my classes here at Indiana University School of Nursing. We are looking up medical adverse events. I’m getting into this field cause I want to help people. I will do my absolute best to ensure that nothing like this every happens on my watch with my patients. I will pray for you. I really respect the fact that your family is attempting to turn this into something positive. I can’t begin to understand your grief even 8 years down the road. My deepest condolences. I’m writing a research papaer on medical error and out of all the articles I’ve read this one has made me the saddest. I can’t imagine how your family felt. I want to first say how sorry I am. I am reading this page because I am currently taking classes to become a pharmacy technician. One of our questions was to research this case. This is really heart breaking. I started reading this and I was about to deal with getting the question wrong because by the end of the first paragraph I was barely able to read the computer screen due to my tears. This family and any other family that has been through this will be in my heart and prayers. I first read your story about a year ago and it brought me to tears. I just read it again today and the tears came flooding back. I am a physician and a mother of two small children. Emily’s story is a reminder to me of the great honor and responsibility I have as a physician to care for and protect my patients to the best of my ability. As a mother, I can only imagine the depth of your pain. Your Emily was a beautiful little girl and I wish with all of my heart that this never happened to your family. I will always remember her story and I will carry it with me throughout my life and my career. I hope you have been able to find some peace in your lives. I am so very sorry for your loss, The pain is something I can only imagine. I know there are many have tried to explain angels and the good god only wishes for us. The most important thing to remember is the happiness and the love you have for this small girl and to know that somewhere she is happy and knows how much you love and cherish her. I am very sorry for your pain. God bless you. I am so sorry for this event. At first as I was reading the story, I was asking how on earth, an overdose when the sodium chloride comes in the premixed bag, being an IV pharmacist, I felt so sorry about the incident, I guess, the problem is not on the technician only, but more so with the system of the facility, which errors can be prevented by double checking. Technicians still under the guidance of pharmacist. I believed that the error was not intentional, its just sometimes it happen. This story is a wake up call for all of us working in a healthcare facilities. I am forwarding this story to our team, for us to be reminded of being careful in everything we do. Once again, we are sorry for this incident with your family. I just pray that you still trust us who are working in this field. I would first like to say I am a college student in the Bakersfield Area. I have studied the process we use to educate children. I have found people who grieve because of your loss and I think they are as supportive for you as any people I have ever seen. the world is a hard place and I know there isnt much I may be able to say. I hope the faith we have in God is enough to reunite us with those we love and I hope you can find time to send a small note to people in this Area to remind them that they need to look forward to the day when we all find the people we love ……again. God bless you..
What a tragic story – that should have NEVER OCCURRED … but I question why a pharmacy technician would be trying to compound a Sodium Chloride solution – when commercially available solutions are generally in abundant supply and generally are inexpensive … Toposar (Etoposide) is generally diluted in either Dextrose 5% or Normal Saline (Sodium Chloride 0.9% solution). But an even bigger question for me – and maybe this is something I am naive too … but why on earth would Chemo be ordered on a patient on a weekend, when staffing is generally significantly reduced. I think the Pharmacy Director and the ordering Physician also share in the blame for helping facilitate the tragic events that unfolded on this ominous Sunday afternoon. Thank you for sharing this story. I have been haunted by many death being a caregiver. This story drives home the importance of why I will become a pharmacy technician. I will bring this up in class tomorrow as our textbook makes this story its opening. I am so sorry for the lost of Emily, such a beautiful child. But I thank you for put my perspective job in calibrated perspective. Bless all of you as Emily looks down upon us all trying to do the best we can. This is so sad. It’s horrible that in order for something to be changed for the better, someone dies first. Sadly, that is the kind of society we live in. No one will take notice of potential dangers until someone, like Emily, pays the consequences. My heart goes out to you, Jerry family. I think that it is wonderful that you guys turned this into such a positive outcome. You have taught me a valuable lesson. As a pharmacy technician student, I will keep my training a high priority and make sure that events like what happened to Emily will never happen to someone else. I just wanted to let you know that I am doing a medication administration error project before I graduate nursing school on May 13 with my RN degree. I am printing pictures of your daughter as photos and making a board on her for my teaching project and the reality of medicine errors. Your story is touching, and her story is being told so that hopefully we can prevent further errors such as this from happening. Your daughter was truly beautiful and reminds me of my self at her age with those baby blue eyes and cotton white blonde hair. While Emily did not live a long life and you may not understand why she was taken from you , I hope You find comfort in knowing her story is being shared to prevent future errors such as the very one who took her from you, I will be happy to share pictures of the board collaboration I am making about her if you would like just please let me know. That’s not what happened. It was all a preventable accident and steps are being taken to never let this happen again. Nobody intentionally hurt Emily. Every person involved with the story has tremendous guilt and are forever changed because of it. Prayers for the family as well as the pharmacist who was blamed for it. I just read your story, so heartbreaking. What a total doll she was, I cannot begin to imagine what your family has went through, but knowing that you are bringing awareness to this type of mistake I am sure has saved hundreds of lives to be sure…. Know that you will see that precious little Doll in a blink of an eye, life is so short and God is so good, God bless you and your family. I just saw Emily’s story on Dr. Oz. I am so touched and amazed at the depth of grace and forgiveness in your life; exhibited by your attitude toward and forgiveness of the pharmacist. The fact that you have not vilified him but rather reached out to him with love and compassion is nothing short of a miracle, in my opinion. Life certainly threw you a devestating curve ball and no one would have blamed you if you had stayed in a place of rage and anger. But instead you’ve allowed this experience to make you a better person; stronger and full of mercy and grace. And you’ve used your tremendous, incalculable loss to make changes in laws that have undoubtedly saved other precious Emilys. I am in awe of the magnitude of grace and strength of will and character exhibited. Emily’s story will live forever because of your willingness to forgive. Wow. That’s an amazing legacy. I am sure that Emily is looking down on you from the lap of God Himself and she is so incredibly proud of you and cheering you on (Hebrews 12:1). Thank you.